Home > Events > CSISS wheels are rolling! Thanks to generous support of the Columbia Shuswap Regional District, CSISS is pleased to announce the acquisition of a new vehicle. This vehicle will enhance our capacity to support invasive species awareness and education thought out the region. Look for us at community events, parks, boat launches and roadsides, as we complete inventories and increase our understanding of priority invasive plants in our region. 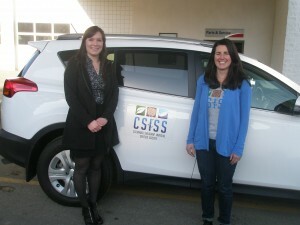 CSISS is grateful for the continuing support of the Columbia Shuswap Regional District, as well as the Ministry of Forests, Lands and Natural Resource Operations, and the Columbia Basin Trust, as we expand upon our existing programming.